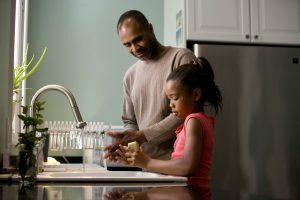 Healthy habits can protect everyone from getting germs or spreading germs at home, school, or work. Simple actions, like covering your mouth and nose and cleaning your hands often, can stop germs, prevent illnesses and reduce sick days. Keeping hands clean is one of the most important ways to prevent the spread of infection and illness. Handwashing is a simple thing and it’s the best way to prevent infection and illness. Clean hands prevent infections. Keeping hands clean prevents illness at home, at school, and at work. Hand hygiene practices are key prevention tools in healthcare settings, in daycare facilities, in schools and public institutions, and for the safety of our food. Handwashing can prevent infection and illness from spreading from family member to family member and, sometimes, throughout a community. The basic rule is to wash hands before preparing food and after handling uncooked meat and poultry, before eating, after changing diapers, after coughing, sneezing, or blowing one’s nose into a tissue, after using the bathroom, and after touching animals or anything in the animal’s environment. Continue rubbing hands for 15-20 seconds. Need a timer? Imagine singing “Happy Birthday” twice through to a friend. “Hand Hygiene Saves Lives: A Patient’s Guide” from the Centers for Disease Control and Prevention.